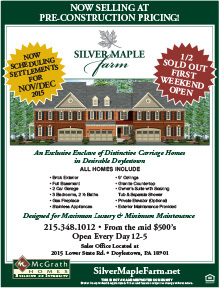 New Homes in Yardley PA from McGrath. A 55 Retirement Community. Discover historic sites and the beautiful park facilities of Washington Crossing State Park, Core Creek Park, and Tyler State Park. Less than an hour away, Philadelphia showcases performing arts, professional sporting events, world-class museums, galleries, fine restaurants, state-of-the-art healthcare, and a gateway to the world via the Philadelphia International Airport. Minutes from I-95, the Pennsylvania Turnpike, Route One, and the New Jersey bridges, The Villas of Newtown offers unparalleled convenience to destinations throughout the region and beyond. Close to everything, yet sheltered from traffic and noise, the community is close enough for a day trip to New York City, the Jersey Shore, or the Pocono Mountains. The Villas of Newtown is simply the best - so much to do, so close to home!